Video Shows Islamic State Blowing Up Iraq's Tomb Of Jonah : The Two-Way The destruction of the holy site has drawn criticism from the Sunni allies of the so-called Islamic State and may cause a rift between the Sunni groups. 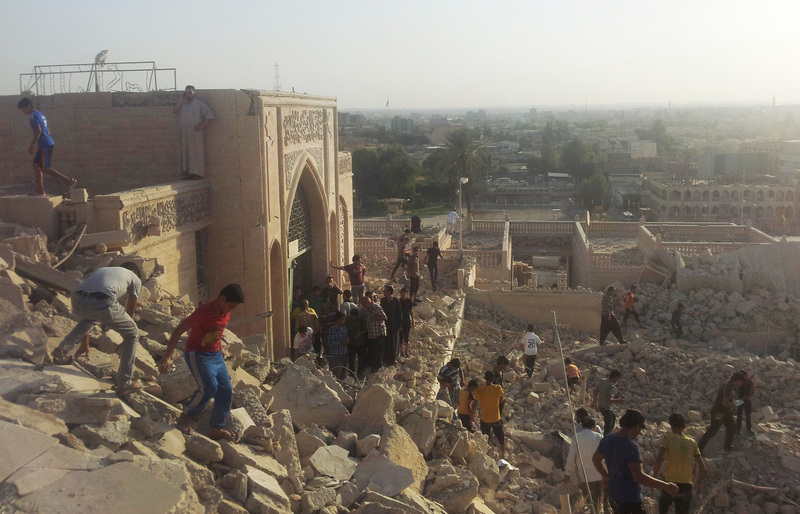 People walk on the rubble of the destroyed Mosque of the Prophet Yunus, or Jonah, in Mosul. The revered Muslim shrine was destroyed on Thursday by militants who overran the city in June and imposed their harsh interpretation of Islamic law.
" 'Islamic State completely destroyed the shrine of Nabi Yunus after telling local families to stay away and closing the roads to a distance of 500 metres from the shrine,' said the official at the Sunni endowment, which manages Sunni religious affairs in Iraq. "The endowment official, who spoke on condition of anonymity, and Mosul residents told AFP it took the Sunni extremists an hour to rig the shrine with explosives.
" 'They first stopped people from praying in it, they fixed explosive charges around and inside it and then blew it up in front of a large gathering of people,' said a witness who did not wish to give his name." One man, who took a video of the explosion from afar, can be heard saying "No, no, no. Prophet Jonah is gone. God, these scoundrels." Leila tells us that the destruction is also drawing criticism from the Islamic State's Sunni allies. "It may cause a deep rift in the uneasy alliances the Sunni extremist group has made with other Sunni fighting groups marginalized," Leila reports. Fresh Air's Terry Gross talked to Letta Tayler, a researcher with Human Rights Watch, who has traveled to Iraq to document the Islamic State's human rights abuses. As you'll hear, the Islamic State — which was formerly known as the Islamic State of Iraq and Syria — has destroyed other holy sites, but they have also expelled and killed Shiites and other religious minorities. The Washington Post talked to Sam Hardy, a professor at the American University of Rome who writes the blog Conflict Antiquities. They asked him why the Islamic State is doing this. "It indicates they are going for total eradication not just of their enemies but even of the possibility of people living together under their rule," he told the paper.